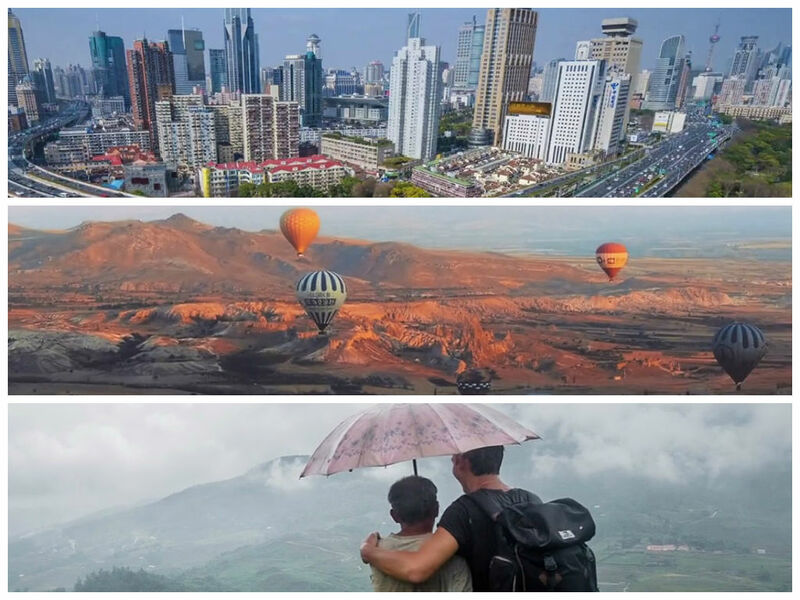 One of the biggest clichés in travel writing is how this one place or that other place is full of contradictions. Grand, old buildings mixed-in with cutting edge, modern architecture, a striking mix of cultures or religions in cafes and on the street, old money next to new money and how that contrast pales next to unspeakable poverty, conservative verses showy and unapologetic modern values — the world is full of places that play host to these contradictory temperaments and aspects of life – side by side, sometimes quite peacefully and sometimes not. While I cringed when “study in contrasts” was the first descriptor that came to mind reflecting back on our time in Skopje, Macedonia during the whistle stop tour of the Balkans, I just can’t help this first impression. 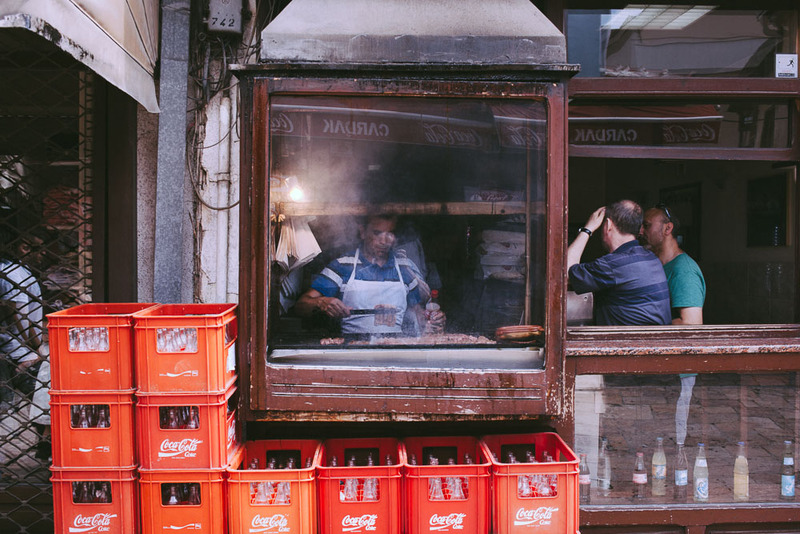 We were only in Skopje for 24 hours, but it left such a strong mark on us — precisely because of these drastic contrasts that we witnessed –that we still talk about it as one of the more fascinating, and bizarre, places we’ve had a chance to experience on our 14-months long trip. Cliché or not, a study in contrasts or contradictions is the best way I can think of how to describe that first impression that Skopje made on us. 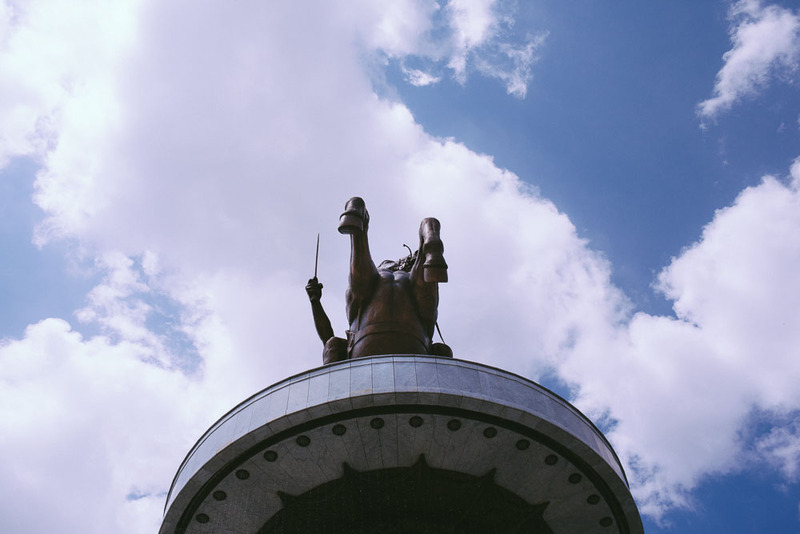 Downtown Skopje is peppered with many statues, but one stands head and shoulders above the rest – “Warrior on a Horse,” Skopje, Macedonia. We arrived in Skopje around 5 am and proceeded to the main town square to find a coffee shop to have some breakfast to wait for our check-in time with our aibnb host – who mercifully agreed to allow us to come by at 8 am (thank you, thank you, thank you!!) We expected to (hopefully) catch up on emails, get a snack, and pretty much just pass the time in the best way we could. Well, we shouldn’t have worried about being bored, or having nothing to explore at the crack of dawn, because – statues. 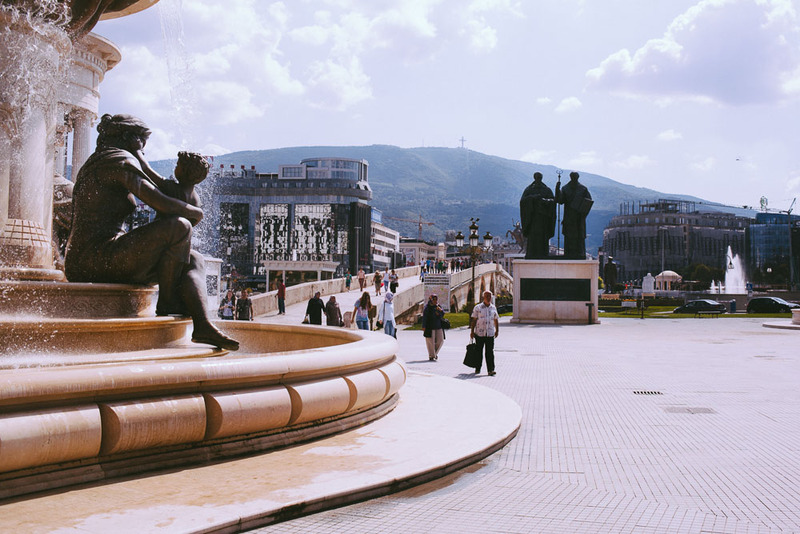 The gigantic square in downtown Skopje has been turned into a statue wonderland, which is fascinating and somewhat grotesque, given that the majority of the installations look to be out of proportion and are way too close to each other for personal space comfort. Statues are everywhere you look in downtown Skopje — including every few feet the length of the bridge spanning the Vardar River. Skopje, Macedonia. You know, just the most visible symbol of the capitol, is a nameless warrior on a horse. A bit further down there is another fountain, this time featuring a woman in different stages of raising her son – some would speculate that this is Olympias, the mother of Alexander, raising her famous son for all those great accomplishments he was destined to achieve. Many, many other statues pepper the main town’s square. Some harken back to the Macedonian Empire, others glorify the two patron saints of Eastern Orthodoxy who first wrote down the Cyrillic alphabet. Then there’s the gargantuan Triumphal Arch at the entrance to the plaza – the walls are inscribed with famous words by Mother Theresa. 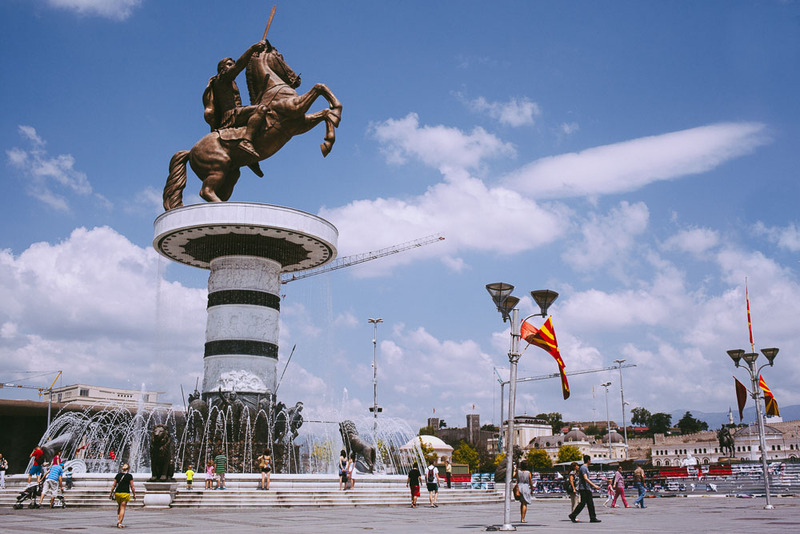 Turns out, the Macedonian government had embarked on an ambitious project – Skopje 2014 – to beautify the purportedly drab national capital and build up Macedonia’s national identity. Forgive me for simplifying this infinitely complex matter (as all questions of border and identities are), but the gist of the story is that the Republic of Macedonia, or the Former Yugoslav Republic of Macedonia, was one of 6 countries to emerge from the rubble of Yugoslavia several decades ago. Never having a been a modern nation state on its own and within the present day borders, and due to the fact that the national history is so intertwined with those of the empires that chartered their borders over Macedonia’s present day territory, the country’s leadership decided that it needed to lay down some identity markers for the country’s citizens. 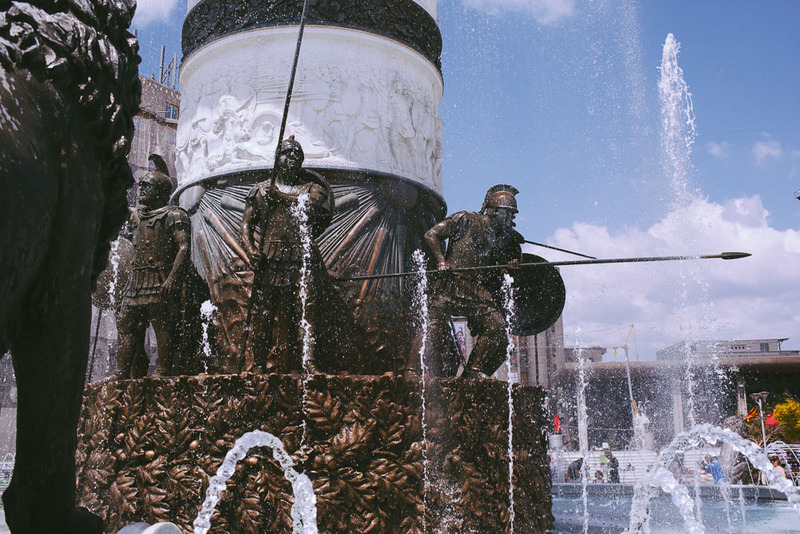 Warriors beneath The Warrior — bathed in a fountain that comes alive at night with a lights and music show. Skopje, Macedonia. However, there are two very big problems with the Skopje 2014 project. 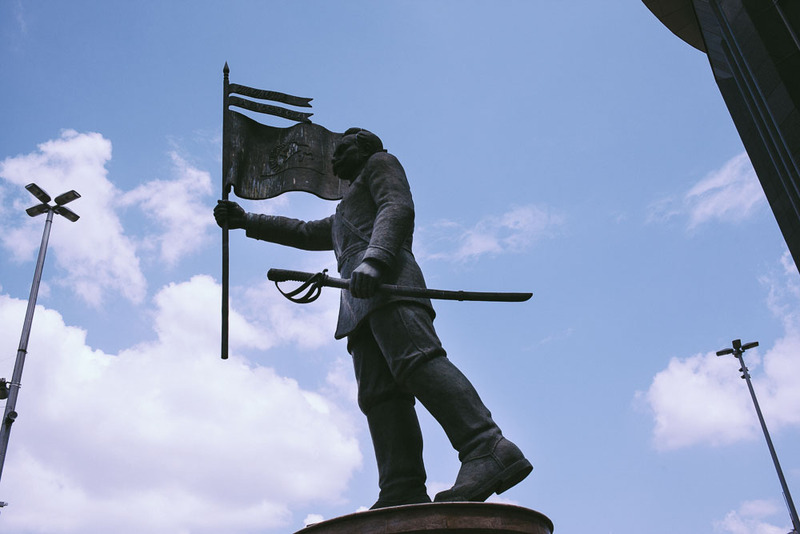 On an international level, a number of states have objected to Macedonia ‘borrowing’ their national heroes. Greece is particularly up in arms over the whole thing. According to the Greek narrative, its own region of Macedonia – the birthplace of Alexander the Great– is the historical home of the Macedonian empire that Greece claims as its own heritage. 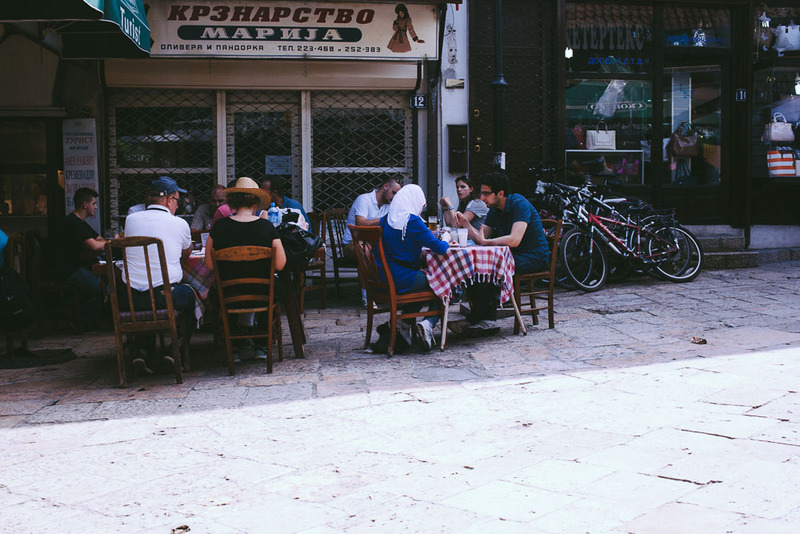 Moreover, while millions of Greeks identify themselves as Macedonian – ethnically, historically, and culturally- they have very little in common with the majority of Slavic population of the country of Macedonia. 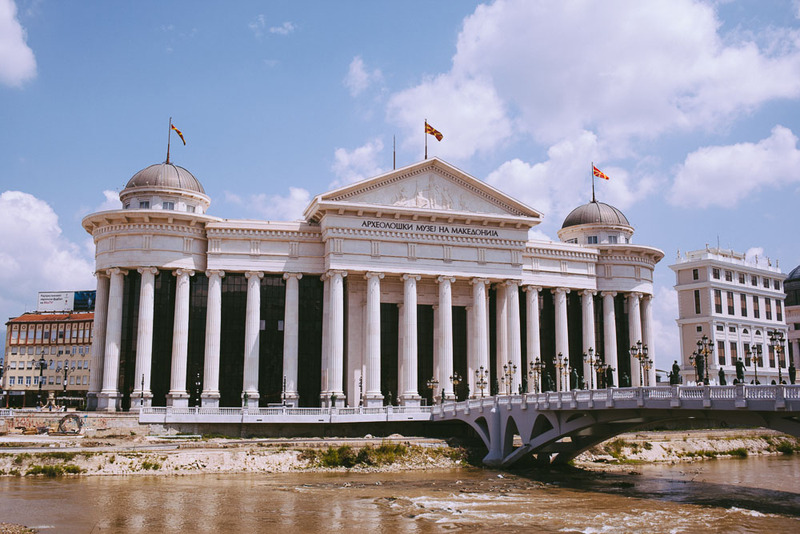 All in all, Greece sees itself – rather than the Republic of Macedonia – as the rightful successor to the Macedonian Empire legacy, and is quite upset over the country’s name and the Warrior statue. Similarly, while Cyril and Methodius – the patron Saints of Eastern Orthodoxy and investors of Cyrillic alphabet – and Mother Theresa may have at one time called Macedonia home – they weren’t Macedonian. And so on for the majority of ‘national heroes’ whose statues now span downtown Skopje. But, wait there’s more. On a national level, Skopje 2014 has been criticized for its politically insensitive, and even racist, lean. 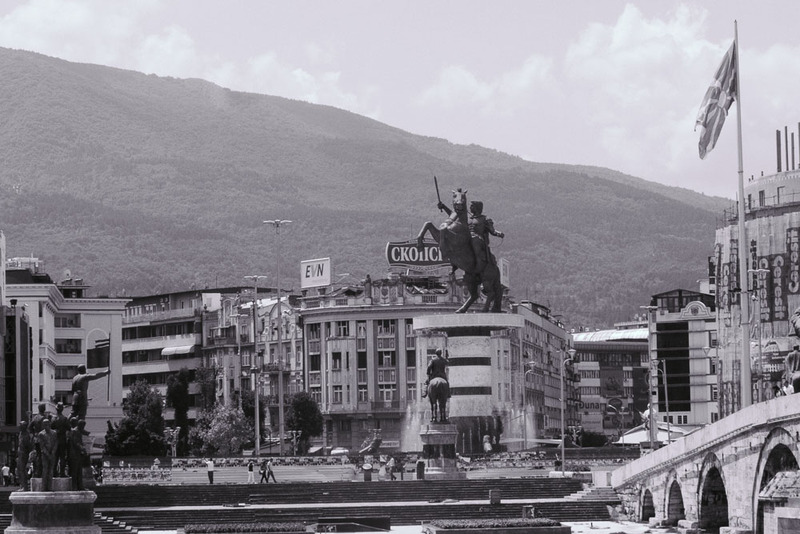 Less than two thirds of Macedonia’s population is ethnically and linguistically Macedonian. A very large minority of the population is Albanian. 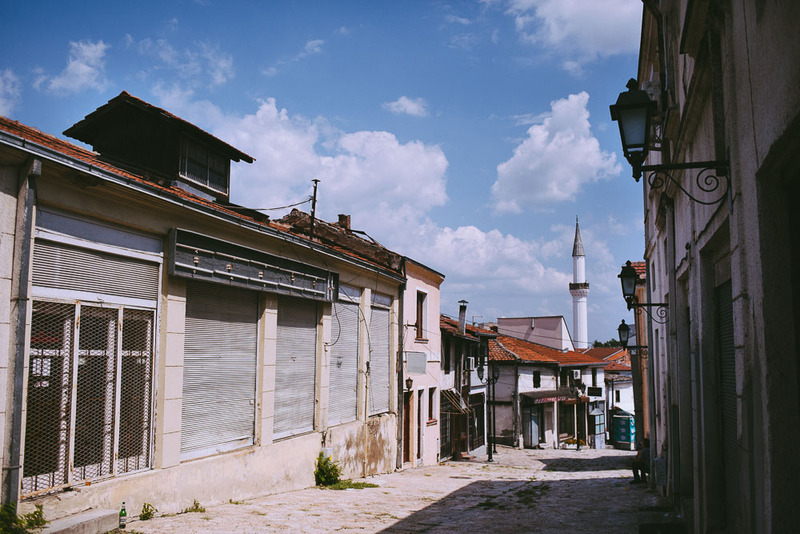 But the Albanian language, culture, identity, as well as religion, which for the most is Islam – have been shunned by the Skopje 2014 identity project; a bit of a problem, particularly, in the region where wars and conflicts over these very same issues have gone on for centuries. Whoops. A short walk from downtown, the old town couldn’t feel, act and be more different. Skopje, Macedonia. 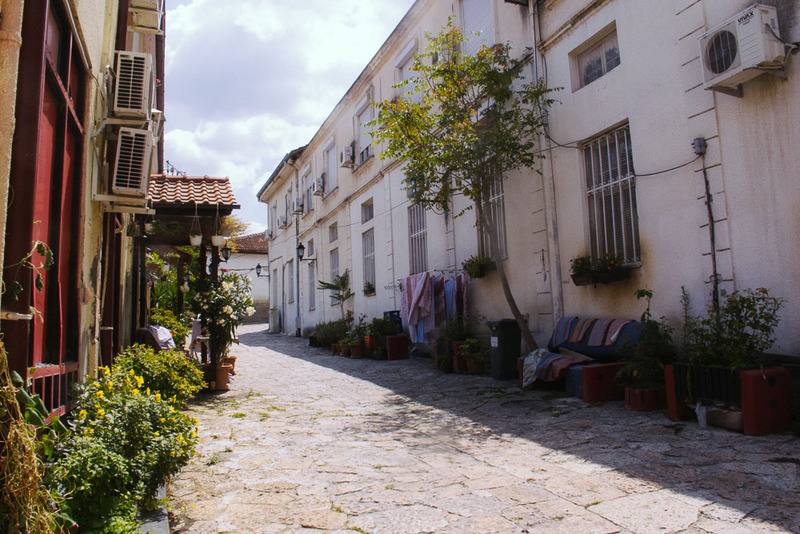 Just a short walk from downtown, the Old Town, on the eastern bank of the Vardar River, looks and feels like a million miles away from downtown Skopje. 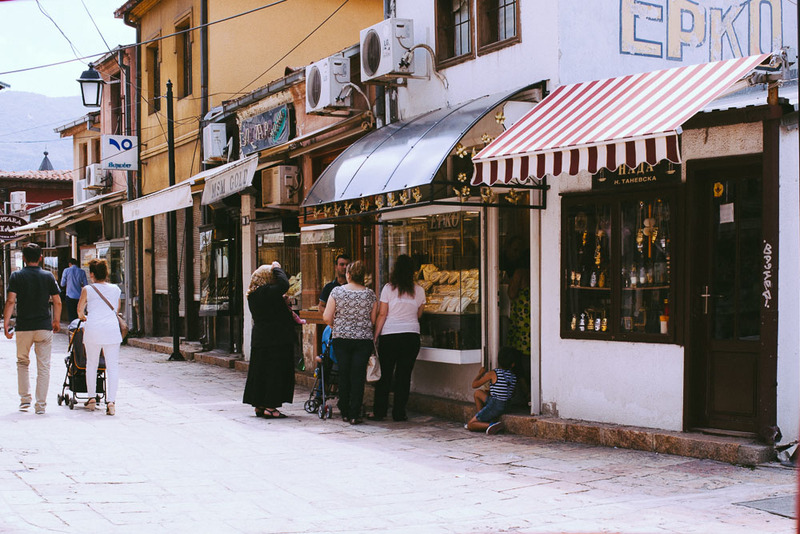 Dominated by the old bazaar, which is a legacy of the Ottoman Empire, this part of town retains much of the character that wouldn’t be out of place elsewhere in the Middle East. Winding streets and old buildings house hidden tea gardens, sidewalk coffee shops, baklava and shaurma counters, museums and galleries, mosques and minarets, and people, people, people everywhere. 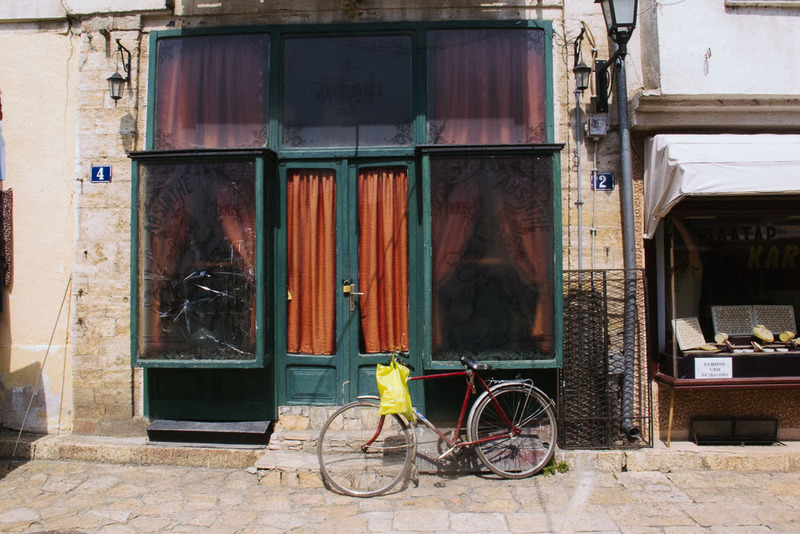 Winding streets of Old Town Skopje, Macedonia. We duck in out of cafes, filling up on Turkish coffee and real, sugary coca cola (no beers sold here! ), unable to get enough of this fascinating change of scene. Everything looked and felt different. To be fair, we have since learned that the government has actually earmarked money and crews to restore and preserve this gem part of town — so it’s not as if old town Skopje is neglected and derelict. 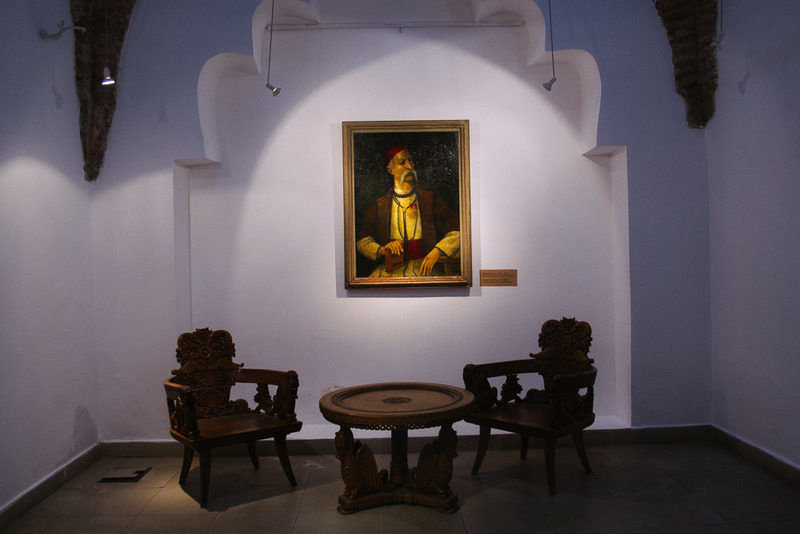 Fancy art installation have opened in restored 15th century Daut Pasha Hamama, which was our favorite. I could spend hours in that building staring up at the ceiling! Exhibition at the Daut Pasha Hamama in Skopje, Macedonia. 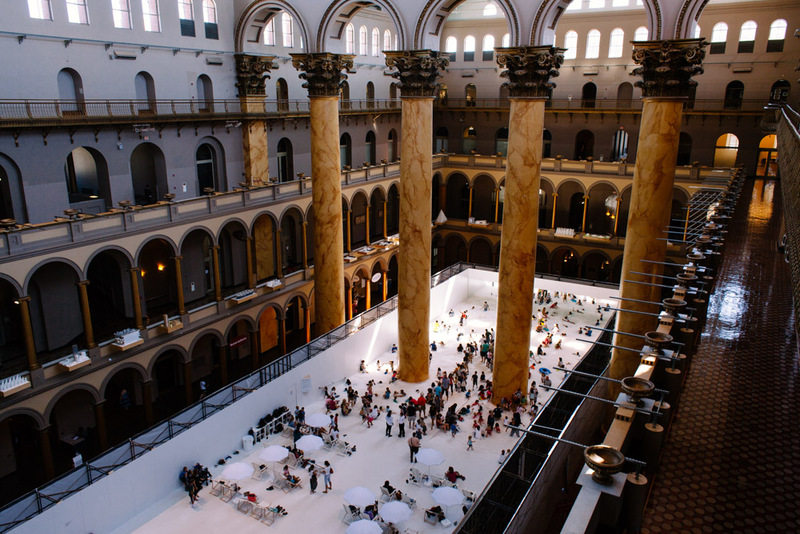 And yet, the contradictions strike again — is the plan to preserve the history, or to make sure that it fits a certain narrative? Behind the Old Bazaar sits the Kale Fortress, whose construction is thought to have been ordered by Emperor Justinian I during Byzantium period in 6th century. 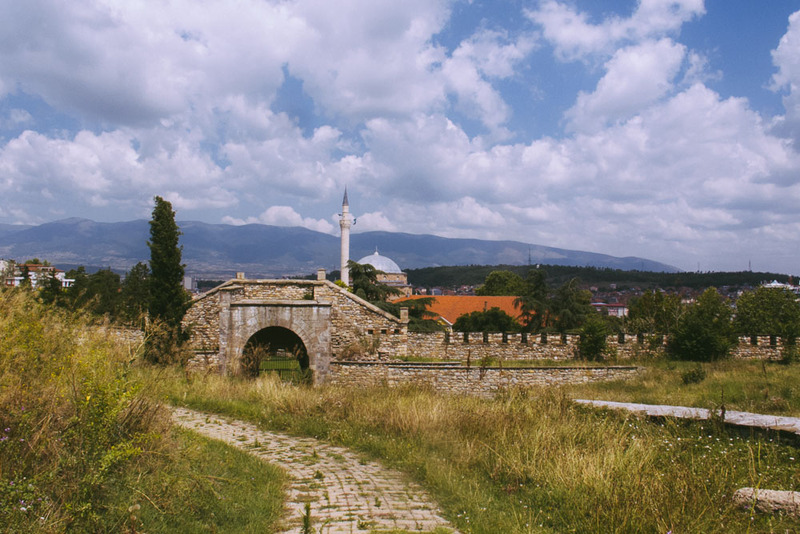 Although clearly original fortress is from an era connected with Christianity, this part of town is unmistakably Muslim in character. Much of the history surrounding the fortress is still unknown, but that didn’t preclude the government from ordering construction of a church / museum on the grounds in 2010. 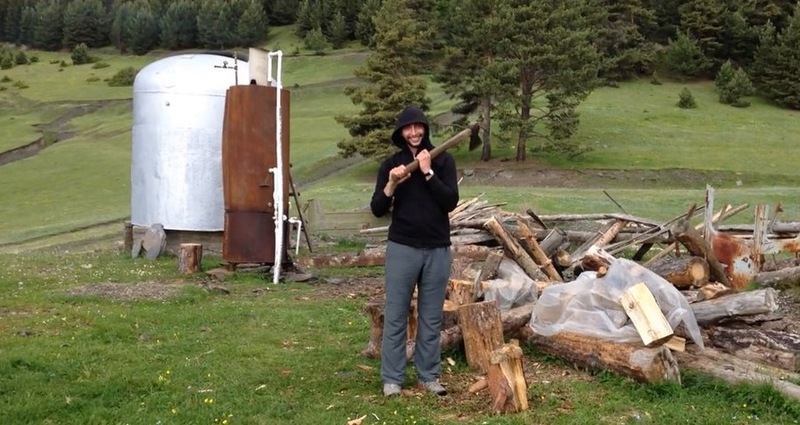 That in turn, led to a violent confrontation between the police and Albanian minority. In the end, the structure was not built, but really? The grounds of Kale Fortress in Skopje, Macedonia. Fascinating how much you can learn in a day, isn’t it? I have certainly glossed over some of the finer points of the complex issues surrounding Macedonia’s history, culture, and identity. 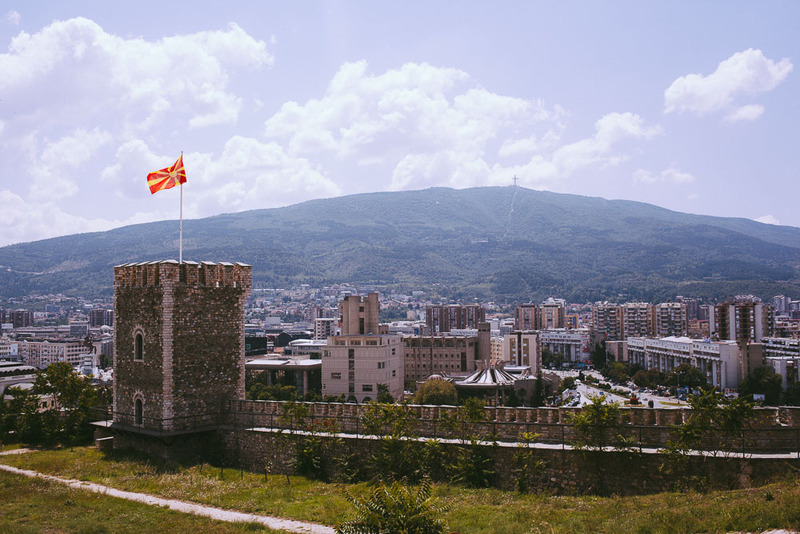 But the point is that Skopje is a fascinating place to ponder our modern nation state model, the questions of nationality and nationalism, and how we can shape and mold history into rather convenient narratives, without really changing the facts.